We had a great opportunity to review another book from the awesome people over at The Mother Company. If you remember a couple months back Liisa reviewed a few of their other books along with their DVD The Friendship Show. This time we got to review their latest book, When Miles Got Mad. When his little brother breaks his favorite toy airplane, MILES GETS MAD. As his anger swells, he suddenly catches sight of himself in the mirror - but instead of his own reflection, a furry red monster with big round eyes and funny teeth stares back at him. By encouraging Miles to use words to express his anger, the Mad Monster helps Miles move through this big emotion to calm himself. Through this fun story and adorable illustrations, this insightful and entertaining children's book offers much-needed comfort to young children as they struggle to regulate their emotions. I thought this was such a great book. The book will not only relate to every child because there are times where they do get upset and their emotions are all over the place to where they don't know how to handle them. 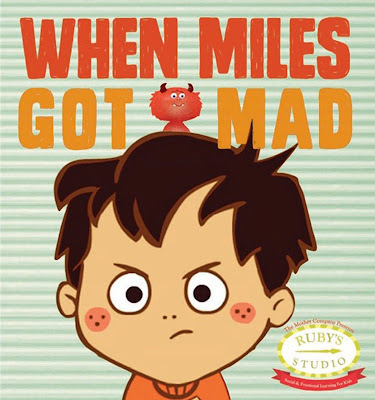 When Miles Got Mad will teach your child that it's okay to get upset, you just have to know how to deal with it and that treating others mean in the process isn't the right way to go about it and that it's also okay to forgive them because everyone makes mistakes. This is a great book for every child as it helps them deals with expressing their emotions and that what their feeling is okay. This is why I'm such a huge fan of The Mother Company. I love that they help young children express their emotions in way that makes the kids feel good and okay about having different feelings. Disclosure: All opinions are my own. I received When Miles Got Mad from The Mother Company at no cost for the purpose of this review. No other compensation was received.